What do you suggest to do for a dog who, I feel anyway, is having bouts of separation anxiety? What are the best methods to use to overcome this? Thanks for your participation, Debbie! You need to desensitize your dog to the triggers of this anxiety. What triggers it? The car keys jangling, putting your shoes and/or coat on, getting your purse ready, or maybe even simply putting your make-up on before you go out. Break it down, and work very slowly. If it's the keys that seem to set it off, pick them up (when your dog is watching or is in hearing distance) and then put them back down. Do this until he isn't showing any signs of getting anxious when you do so. Then pick them up and carry them around for a minute (be sure to jangle them). Again, do this for a few days even, until it doesn't affect the dog anymore. Then add something to the routine - pick up the keys, and put your shoes on. Then take your shoes off again and sit back down to watch TV. Remember, it takes a lot of time to desensitize a dog to anything. Very slowly, add things until you're actually opening the front door and closing it again right away. Do this until the dog doesn't seem distressed. The next step would be to step outside the door and close it behind you for a few seconds, then go back in and take everything off. Slowly build up the time you stay outside - 30 seconds, a minute, 2 minutes, and so on. In all this, don't ever "coddle" your dog when he's acting anxiously (petting, telling him it's OK). If so, you are inadvertently praising him for this behavior. Don't make a big deal of the above steps either. You want the dog to see it as a normal thing that happens, not something to be worried about. Now, if the dog gets destructive while you are away, I recommend crating him. 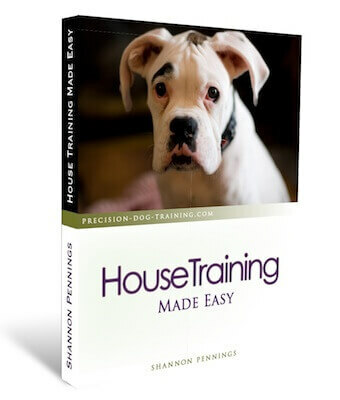 Read the article on crate training a dog under the tab "Dog and Puppy Care". Leave some chew toys to keep him occupied (try a kong with a little bit of peanut butter inside! ), and try leaving an old article of clothing of yours with him (be sure that it's something you don't mind if he chews up!). Also, it's a good idea to always exercise your dog before you go out. 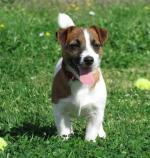 Take him for a brisk walk or run to burn some energy, and make sure he has the opportunity to relieve himself. Crate training is itself something that takes a bit of time, too. You can't just put him in it for the first time and then leave for 6 hours, or he'll hate the crate! Instead, while you are working up to the time spent in the crate, barricade the dog in a safe room while you are away for the time being. While you're working on crate training (because it's also a separation anxiety issue), don't only crate the dog when you go out. Be sure to crate him regularly while you are home, too, so that he doesn't associate the crate with you leaving him. I hope I've given you something new to think about and work with. Again, read the article I've written on crate training a dog properly. And good luck!